Belgian Sebastien Delfosse (Crelan-Euphony) won today's big German one-day race Rund um Köln as he was the fastest of the trio which had gone clear from today's early breakaway. He beat Pieter Jacobs (Topsport Vlaaderen) and Georg Preidler (Argos-Shimano) in the final dash to the line. The old German one-day race Rund um Köln was held today on a 192,6km route from Hückeswagen to Köln. After 50km of racing a large group went clear and the peloton was never able to bring back the escapees. 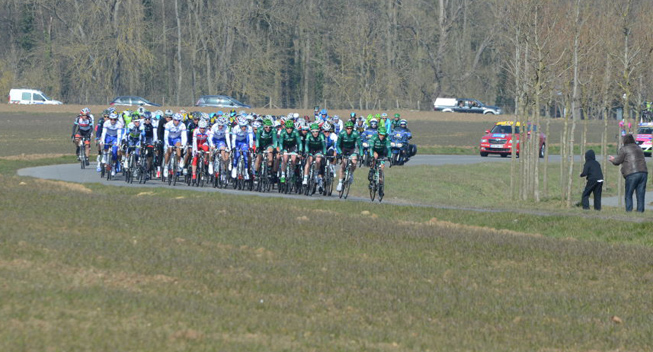 The break got smaller and smaller as riders gradually fell off and at one point 15 riders remained at the front. Georg Preidler, Pieter Jacobs and Sebastien Delfosse managed to escape their companions on the last lap in the city of Köln. The three riders had to decide the race in a final sprint and Delfosse emerged as the fastest ahead of Jacobs and Preidler. Hence, the Belgian took his second win in a week after his victory in last Sunday's Circuit de Wallonie. Preidler's teammate, last year's Tour de l'Avenir winner Warren Barguil, won the sprint for fourth while the Paris-Roubaix runner-up Sep Vanmarcke finished 5th. Hence, the two big home favourites, Andre Greipel (Lotto-Belisol) and the Milan-Sanremo winner Gerald Ciolek, never played the key role that most has expected.